Home » Traditional Greece Silk embroidery on cotton chemise. Silk embroidery on cotton chemise. Traditional Greece Silk embroidery, 19th century. 1.4.6. 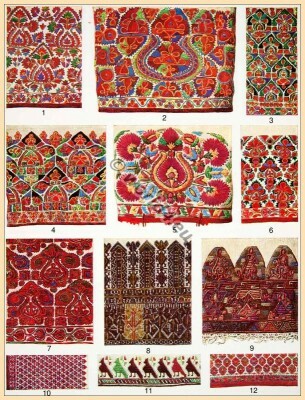 Silk embroidery from the sleeves of women’s chemises. 5. Silk embroidery from the sleeve of a linen chemise, used as a handbag. 7.10.12. Cotton embroidery on the sleeves of a cotton chemise. 8. Silk embroidery on the hem of a cotton chemise. 11. Silk embroidery on the hem of a linen chemise. This entry was posted in 19th Century, Ancient Greece, Embroidery, Fabric, Traditional and tagged Embroidery designs, Textile design on 9/7/13 by world4.